Modern beachside pool home with guest cottage, beautiful gardens, outdoor entertainment area, and room to expand with adjacent lot included. The main house has a spacious master bedroom suite with loft for guests and a private bathroom. The kitchen is very modern with top-notch appliances. The living room has high ceilings and opens to the outdoor swimming pool with adjacent covered entertainment deck for indoor/outdoor entertainment. The pool area connects to a separate guest cottage with a large bedroom and bath that includes an under-roof outdoor private shower to enjoy nature as you bathe. Beautiful wood ceilings throughout the home including the covered carport. Included in the price is an adjacent lot with room to expand or keep a horse. 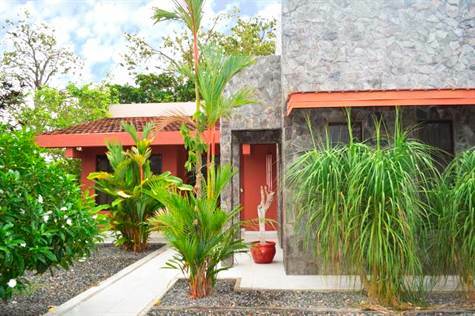 The property has beautiful tropical landscaping and comes fully furnished inside and out. A beautiful pristine beach is only a 3-minute walk away. Esterillos Este is a surfer's dream area with a number of beachfront restaurants to satisfy every palate all within walking distance of this beautiful beachside home.